Y'all know I'm already tired. This dissertation is wearing me OUT! However, it's hard to focus with all of the crazy happening in the world. I try to keep the blog light and inspirational, but this is not one of those posts. This week has been full of racially-charged incidents that are making me WEARY!!! Let's run it down: Paula Deen, Zimmerman's case, Voting Rights Act, Dark Girls premier, Fisher case, and the list goes on. I usually block names, but I'm not for this post. When you put things into cyberspace, you should stand behind them. In fairness, I won't block my own. I'm good with everybody knowing where I stand on this issue. Before I post the chain of comments, let's stop here and establish a few things. I do not think that Leslie is a racist based on this one post. She tends to post sarcastically (her posts about her kids - hilarious), but her post didn't go over well for me, and thus, it is going to serve as an example of some larger issues today. All of my comments were about her post, not the sum total of who she is as a person. I did not care if her question was rhetorical. 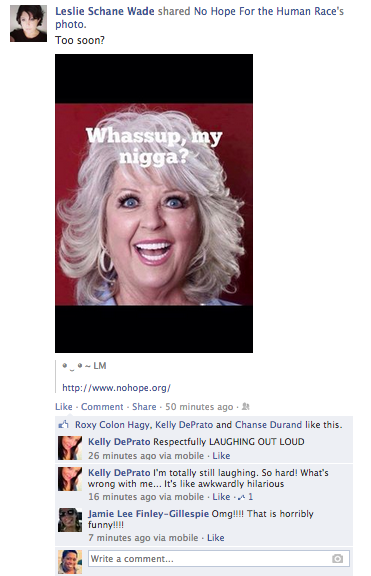 The Paula Deen jokes, memes, and hashtags are growing old. I promised to let it go, but then the misinformed stepped in. I don't know who Jamie is, but the "at least she was honest" was telling. I appreciated Deen's candor. I like my racism upfront. Microagressions and subtlety leave too much wiggle room for pointing it out. Deen's honesty doesn't mean she shouldn't face consequences for it. Leslie's "you're wrong" didn't phase me much either. I think Leslie was actually trying to take a jab at Paula Deen; she's entitled to her misguided opinion. At this point, I knew I wasn't going to sit on my hands. I had read the Deen case court deposition and was appalled. I just decided to let 'er rip in the nicest way I could. Lord, I was trying to be nice. I certainly don't need a lesson in shock humor. I know what shock humor is all about. Louis CK does it so much better. Family Guy, which also is a bit much for me, is smarter than this post. I think Kelly thought she was cute and/or funny about having drinks. And then Jamie tossed me this curve ball. Jamie - I can't. I just refuse to. I don't even know what that was supposed to mean. Maybe tagging a black guy was her way of going "I can't be racist. I have a Black friend." Maybe she was trying to patronize me. Maybe she was calling on a black friend to step in and cosign. So glad he didn't. Who knows? Girl, bye. Like I said in my last comment above, this string of posts was classic, classic and funny, but not in a good way. They were feeling guilty (despite their proclamations that they didn't) for something that they didn't really have to feel guilty for liking or enjoying. Stand on what you find funny, ladies! No one offered the explanation about why it was funny before I said anything, so no need to try to pull out your "I'm-not-racist-Racism-is-funny-I'm-close-to-Black-people" schtick. Don't offer me misinformed explanations of the funniness of racism. Don't tell me how wrong I am for not finding a joke funny. Jamie, you failed to really know about the Paula Deen case before defending her old-school brand of bigotry. The post went on for a little longer, but it was the same brand of BS, and I was done. People of color, be SILENT when folks are laughing at something you don't find funny. Otherwise, you run the risk of making folks think you're calling them racist, even though you said nothing of the sort. Funny thing, racism is so much bigger than a tacky post. When your points are shoddy, throw all kinds of irrelevant stuff at the person's dissension - concerns at your daughter's school, Candy Crush, the argument "everyone's racist" (not true). Just throw all of that out there and pray that it sticks. 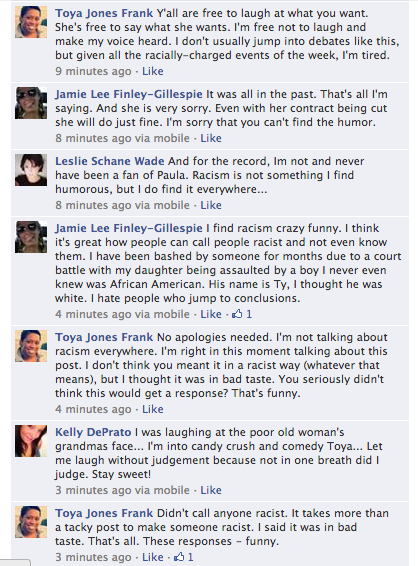 Racism is "crazy funny." Just laugh at it, and everything will be alright. When nothing else works, be patronizing. This post has all of the trappings of classic unproductive dialogue about race. I feel like it was counterproductive, and I wonder if I wasted my time. I NEVER respond to stupid stuff like this, but I had hit capacity. We've got to do better. This stuff is so complicated. I wanted to offer a them long diatribe about race and power and humor, but when folks already don't get it, you don't go over their heads. I wanted to be silent, but my conscience wouldn't let me. They wanted to silence me, but their arguments were dumb. I'll leave this alone because I could write for days. Feel free to comment below and share your thoughts. 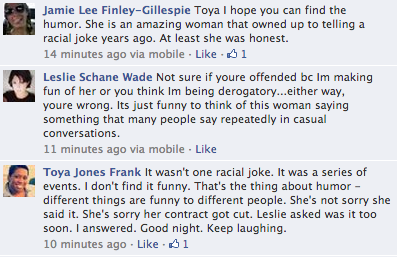 I'm still having a hard time digesting, "I find racism crazy funny." No, Jamie. Just no. Exactly. We have miles to go. Toya it'e interesting how "Too soon and in bad taste" turned into irrelevant comments about #1 Candy Crush??? ?, #2 something about somebody's child that nobody really grasped?? ?, and #3 a black boyfriend???? After reading the whole post it was very obvious that they didn't think that through or else irrelevant stuff wouldn't have been included in order to conceal the guilt. And your were right to say "TOO SOON". People want to stay complicit in their ignorance, and it won't happen on my watch. Caring so much is exhausting, but we gotta keep fighting the fight.